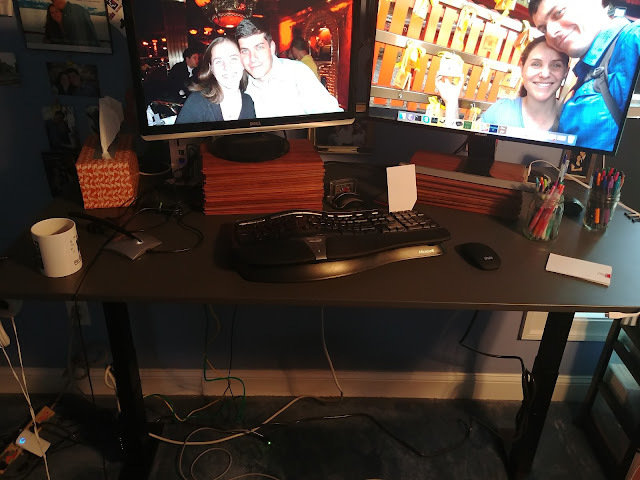 Shira surprised me with quite the birthday gift: a Jarvis standing desk. I'd never used a standing desk before, and was skeptical to say the least. I was actually shocked to find that once the desk was properly aligned, typing on it was totally natural. For the first few days of using the desk, I found I was playing a mental game of tug of war. I'd get a noticeable sensation suggesting: uh, we're trying to work, shouldn't we be sitting right now?, and then another part of my brain would chime in: but this is comfortable; let's do this standing thing!, and back and forth my brain would go. I also noticed some soreness in my core; dude, I was getting an ab workout from programming! A week in, and the voices in my head have calmed down (or at least moved on to other matters). And my ab soreness has subsided (oh well). Most importantly, I find that for quite a few tasks, standing is by far more comfortable than sitting. It doesn't make logical sense, but there you go. I guess I was expecting a standing desk to be at a minimum an acquired taste. Or maybe a trend like minimalist running shoes, where you need to build up certain muscles before you can enjoy the benefits of the new setup. But that doesn't seem to be the case: standing Just Works. The assembly of the Jarvis desk was OK. The instructions were hard to follow and printed densely on a sheet of paper. On top of that, there was an additional sheet of paper that contained instructions that superseded a single step of the original instructions. We got through it, and I'm not worried about the desk collapsing. However, there's serious room for improvement here. A far better solution would have been to include a single sheet of paper that was nothing but a QR Code / URL, that directed users to a web page. Once there, users should be able to view high resolution photos and watch a video that steps through the entire assembly. It's not hard to do, but it does take a change in philosophy from the old school paper instructions route. Shira opted to get me a desk model that has 'memory,' which makes switching between sitting and standing a breeze. I've got nothing to compare this to, but my sense is that this feature is key. A "Gym Flooring" square helps a lot for standing. Thanks for the tip - I'll have to give it a try.